A handful of evocative, one hundred year old embroidered postcards in my possession have always exerted a potent fascination. The pity is that I found them in a box of my grandmother’s possessions after her death and so I lost the chance to ask her about them. From what I know of my family’s past, however, these must have belonged to her mother and were sent by my great-grandfather and my great-grandmother’s brother from the Western Front during World War One. 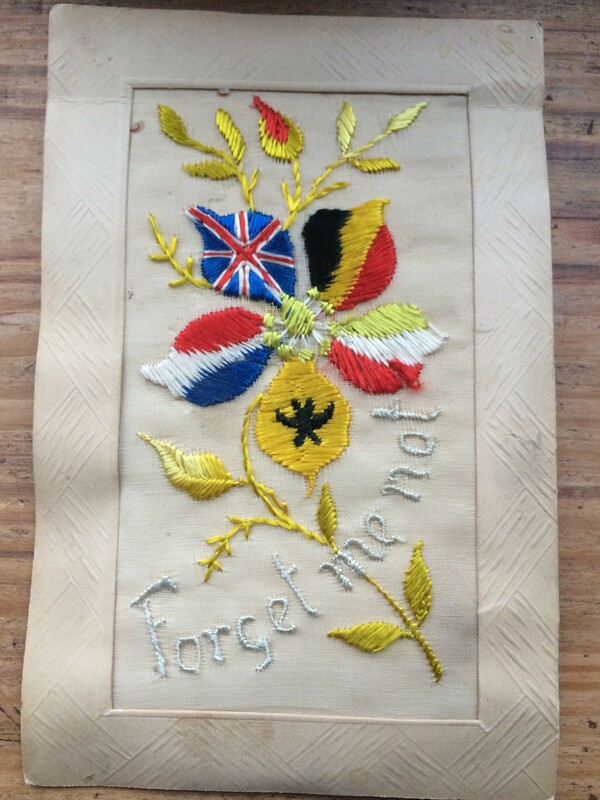 Despite their age, the embroidered threads are still vibrant and colourful – a testament perhaps to the quality of work of the French and Belgian housewives who embroidered them onto strips of white organza by means of a home loom before sending them off to a factory to be made into postcards. I often take out these postcards and look at them. 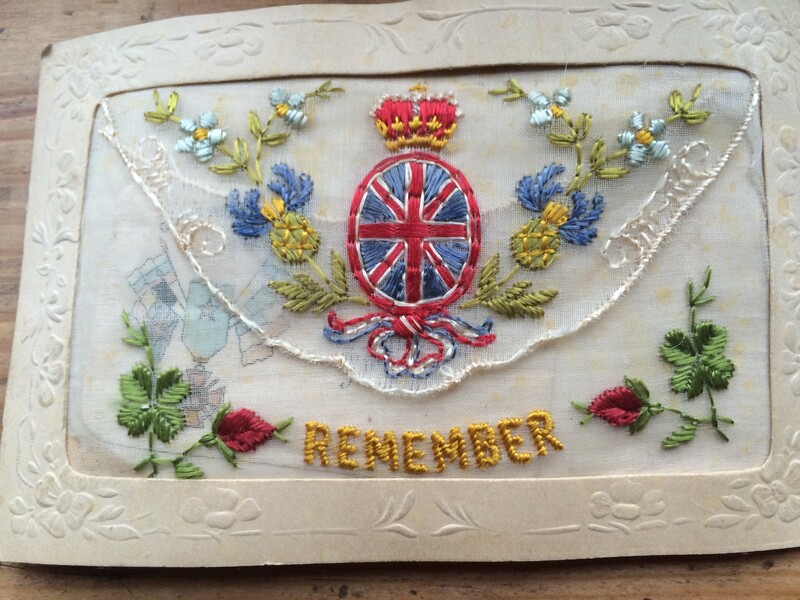 They are undoubtedly sentimental and rather saccharine, with their emotive wording designed to evoke love, duty, patriotism and thoughts of family – no doubt anodyne enough to be proudly displayed on the mantelpiece at home for all to see – but also a visual reminder that a loved one was fighting for King and Country. 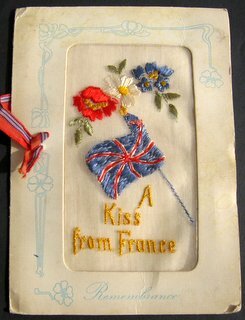 The simple greetings, such as ‘Forget Me Not’, ‘Far Yet Near’ or ‘A Kiss from France’ and the small space provided for a short message didn’t require any great eloquence on the part of the sender or allow for any mention of the horrors of trench warfare, which may account for their popularity among the troops. Back home in Britain, such attractive designs and syrupy greetings were welcomed as they were, after all, infinitely preferable to receiving notification of a death, injury or capture by the enemy, sentiments usually communicated by the feared telegram – the leitmotif of the darker side of the war. 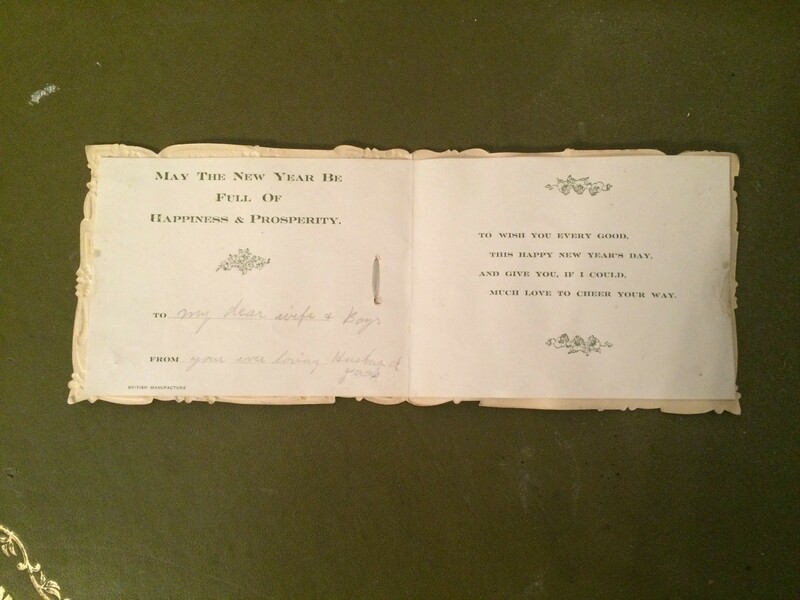 Each time I hold these poignant mementos in my hands, I picture my great-grandmother doing the same thing during those emotional roller-coaster years of 1914-1918. I wonder what swell of thoughts and feelings must have ebbed and flowed in her mind. She would have found them pretty to look at, of course, and it meant her husband and brother were thinking of her. But it was what they symbolised that would be far more potent. Here was the proof – wonderful, glorious proof! – that at the time of writing at least, they were still alive. The visceral relief in that moment of opening it and finding that her fears for their safety were assuaged must have been overwhelming. I can’t truly know what my great grandmother felt; I can only imagine myself back one hundred years as if it were my husband and two sons fighting for King and Country. It is then that I find there are no words. WWI Centenary. Lest we forget. During the First World War a group of British women, who became known as Canary Girls or Canaries, risked their lives every day by turning up for work. Yet they were nowhere near the front line. 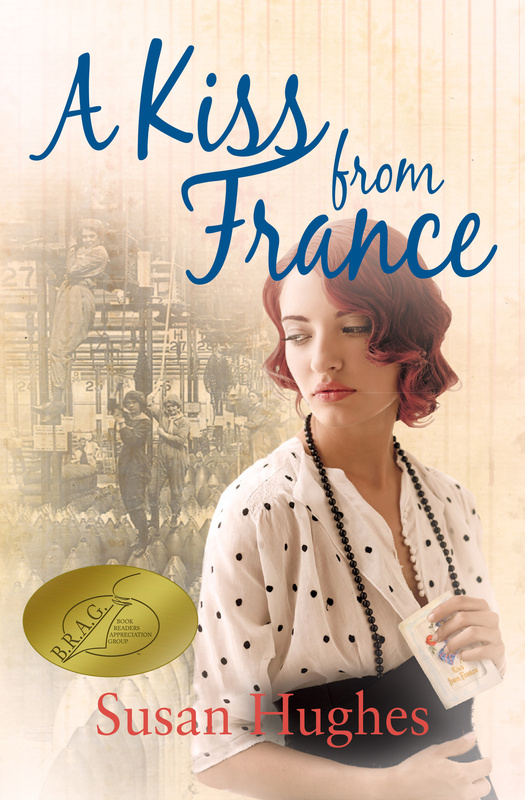 So when I wanted to write a novel about women’s lives during the 1914-1918 war, I decided I didn’t want to invent characters who were upper or middle class members of the Voluntary Aid Detachment (VAD) or the First Aid Nursing Yeomanry (FANY) – essentially extensions of women’s accepted role as carer – but take my inspiration from women who filled the roles which would historically only have been done by men. Step up the Canary Girls! Canary Girls got their name because they worked in British munitions factories, filling ammunition shells with explosives – the toxic nature of which turned their hands and skin yellow after prolonged exposure. It sounds like an innocuous nickname but it masked the very real danger inherent in their work. The explosive was Trinitrotoluene (TNT), a very unstable compound of nitric and sulphuric acids mixed with other chemicals. Not only could careless handling of this prove fatal – at least two munitions factories in Britain exploded during the war, killing 400 civilians – it was also deleterious to the women’s long-term health. Yellow skin might be a precursor to anaemia, liver damage, a weakened immune system and an early death. Yet, despite knowing the obvious risks at the outset, around 64,000 of the 815,000 British women who went to work in munitions factories during the First World War filled these shells. Why did they? They were an ‘army’ of patriotic women. By risking their lives working in the Danger Buildings in munitions factories, the Canary Girls felt they were doing just as much as the men fighting at the Front to help Britain win the war. Social freedom. Many female munitions workers had been in domestic service before the war, where they led isolated and confined lives of drudgery below stairs with little outside social interaction and no real life of their own. Other women left home and moved away from the influence of their families for the first time to work in munitions. The war opened the cage door. “You might be dead tomorrow,”was the prevailing morality in wartime Britain. When subjected to enemy bombing from Zeppelins and Gotha planes, taking your life in your hands by filling shells with explosives took on a very different hue. It was challenging and exciting. It might have been dangerous, but it was also exciting. Many women relished learning new skills and doing ‘men’s work’. Economic independence. Munitions gave many working class women regular, full-time and well-paid work. Earnings as a Canary Girl were three times higher than those offered by domestic service or pre-war factory work. Many flaunted their new wealth by buying fur coats and silk stockings, luxury apparel previously only worn by women of a higher class. Many accepted it was only for the duration of the war. As soon as the war ended, munitions factories began to wind down operations or close and many of the Canary Girls returned to their pre-war roles as homemakers, wives, and mothers or took low paid ‘women’s work’ jobs. However, their aspirations had moved on. The pre-war attitudes towards women and work would not alter completely, but their lives would never be the same again. What do you think? If you were a woman living through the 1914-1918 war, would you have volunteered to fill shells with TNT?